Podcast via Against the Grain. ” is a Professor in the prestigious Department of Sociology at the University of Wisconsin, Madison — and a staunch advocate of a universal basic income. 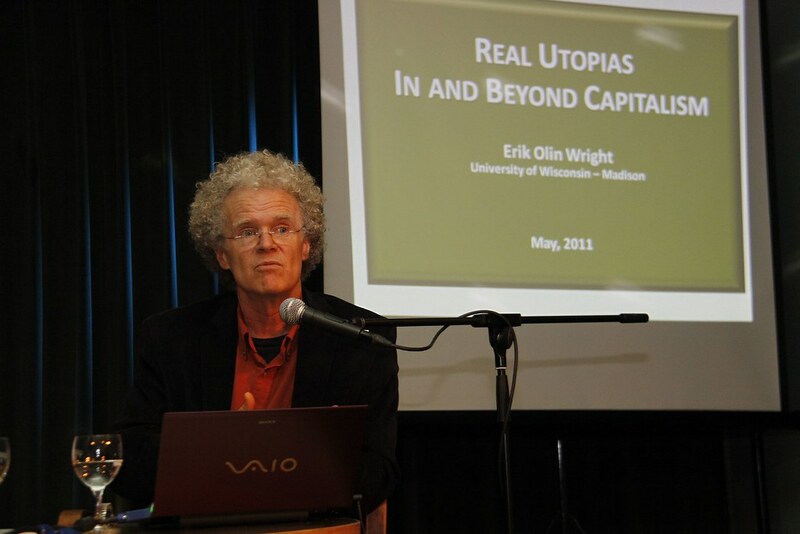 Wright was interviewed on the April 5th edition of the Berkeley-based radio show Against the Grain. In a broadcast of approximately 50 minutes, the distinguished sociologist explains why a basic income would not be a “disincentive” to work (unlike means-tested anti-poverty programs), argues that basic income does not “subsidize low wages” in a morally problematic way, discusses the potential impact of basic income on unions and progressive politics, and differentiates his preferred version of a basic income from that of Charles Murray and others on the right — and more. Overall, Wright presents a persuasive and compelling case that the radical left must take basic income seriously, while allaying worries that the policy could hurt workers and rebutting objections to its unconditionality. “AGAINST THE GRAIN—[5 APR 2016] “Today on Against the Grain, what if everyone was entitled to, was guaranteed, a basic income, so they didn’t have to work to live?